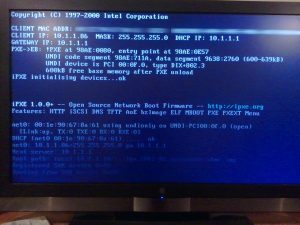 NOTE: This is Part 5 in a series on booting Ubuntu from an iSCSI disk. View all of the sections here. 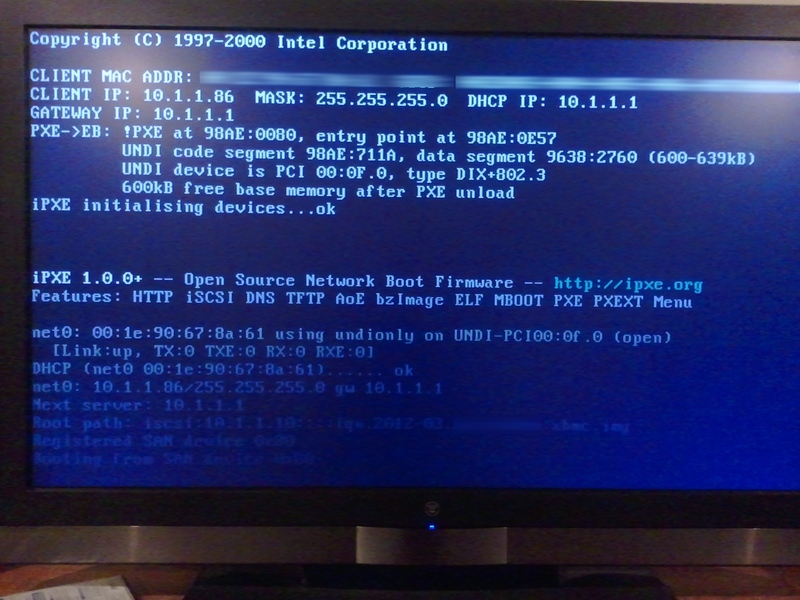 Previously we setup a iSCSI target (server) and installed Ubuntu to the iSCSI disk. We also setup iPXE on the server, but we need to configure dnsmasq to route the client correctly. We already have the server configured so now let’s work through the roles of the DHCP server. The DHCP server needs to respond to DHCP requests with the TFTP server information. Any clients not concerned with iSCSI booting will ignore the extra information while our iSCSI initiator will use it to download and run the iPXE executable. 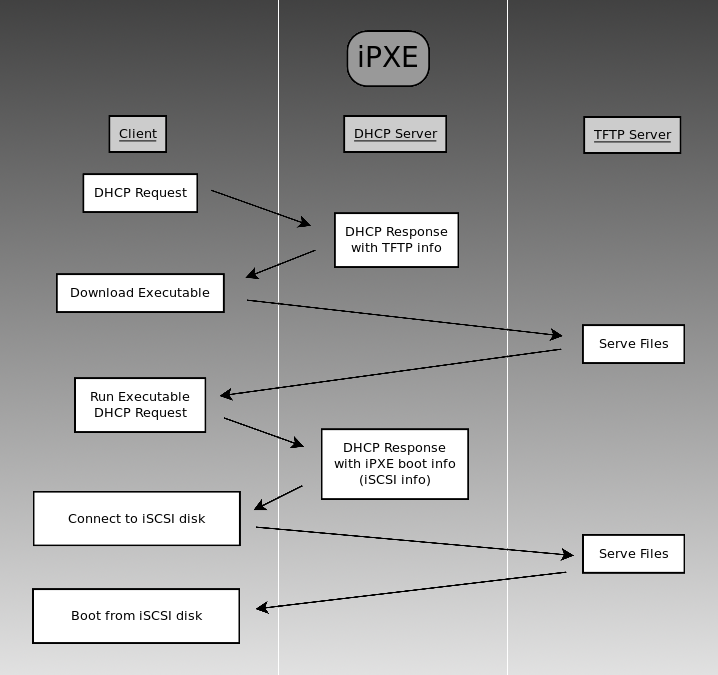 The iPXE executable, when run, makes an additional, special DHCP request that includes a flag indicating that the request was made from an iPXE executable. When the DHCP server receives this type of request, it needs to respond with the iSCSI connection information, rather than the TFTP info. Note: I don’t have a server running dhcpd at this time so this section is entirely hearsay until I learn otherwise. Where 192.168.0.101 is the IP of the TFTP server you setup in Part 4. That takes care of roll #1 of the DHCP server. You should now be able to test your progress by booting your client machine. You should see iPXE start, request an IP address, which will cause it to re-run iPXE in an infinite loop. That’s a good thing… for now. Where 192.168.0.101 is your iSCSI target. Again, find lots of useful information here. That takes care of the DHCP server’s second role. If everything is configured properly, you’re done! Grab a cold one and watch as your system follows the boot process outlined above to load GRUB, which in turn boots Ubuntu! Side note: If you’re using untangle as your DHCP server, you can click Config > Networking > Advanced > DHCP & DNS. Any text entered in the text box here will be magically added to dnsmasq.conf and the dnsmasq service will be restarted for you when you click the Apply button. #In the previous line, the # symbol is not a comment, it is a negation operator. That takes care of the DHCP server’s first role. You should now be able to test your progress by booting your client machine. You should see iPXE start, request an IP address, which will cause it to re-run iPXE in an infinite loop. That’s a good thing… for now. Line 1 checks if dhcp-option 175 (iPXE/gPXE related option) was specified by the client, and if so, it tags the request with IPXEBOOT. Line 2 sets option number 175 to 8:1:1 which effectively enables the KEEP_SAN_ALIVE parameter which is required for iSCSI booting. Line 3 once again sets a conditional boot option. If the request has been tagged with the “IPXEBOOT” tag, then specify the iSCSI disk as the path name to the client’s root disk (i.e. option 17). That takes care of the DHCP server’s second role. If everything is correct, you’re done! Grab a cold one and watch as your system follows the boot process outlined above to load GRUB, which in turn boots Ubuntu! but otherwise it worked as indicated! Sir, you are a magician. I’m now booting 10.12 from an iscsi target. Maybe there could be a way of booting a Ubuntu live CD using iPXE but haven’t figured it out yet. Thanks! I’ve added your comments to the original post. 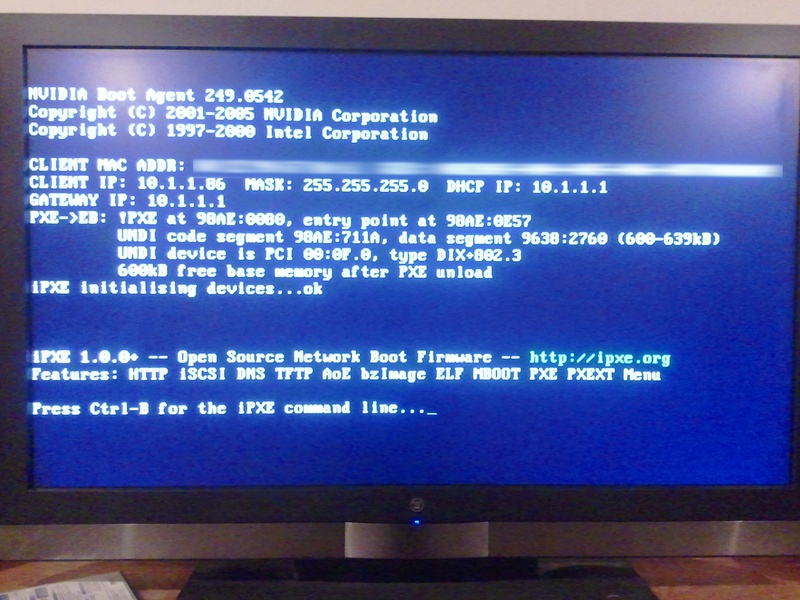 If you just want to boot from an .iso stored on a network drive, you can do that with plain PXE and TFTP. You don’t need all of the extra software described here. Although, if you have already got iPXE and iSCSI setup, I would imagine you could simply replace the .img file we created in part one with an .iso file. That would be a fun experiment. ALERT! /dev/disk/by-uuid/ does not exist. Dropping to a shell! Ubuntu 12.04. I upgraded to GRUB 2, but that is not the problem since the old GRUB had this exact same problem, which is why I tried the upgrade. If GRUB is loading, then that means you’ve got the iSCSI part configured correctly–assuming your followed this tutorial–because we installed GRUB to the iSCSI disk. So that’s good! Obviously, put your UUID in there, not mine. After that press F10 (I think it’s F10, maybe it’s a different key) to boot the modified file. Oh no! I’m really sorry, the UUID was there. I removed it because I knew what it specifically was didn’t matter so I didn’t type it all out. I meant to put a root=UUID= or something. I’m sorry about that :-/ Have you any other guesses about where things are failing? No problem. The message indicates that the kernel is loaded, but can’t find the root device (aka hard drive partition) where your system is installed. So to reiterate, that means that grub was able to connect to the iSCSI partition and load the kernel image, but the kernel couldn’t connect to/find the partition. First, if you’re not using ISCSI_USERNAME and ISCSI_PASSWORD I would omit them. If it’s not there, you’ll need to go back and add that module to the kernel. Follow Part 3 in the tutorial after the section where it says DO NOT REBOOT. I figured something out! Even though I keep putting placeholders for my passwords and usernames and UUIDs, this website is stripping them because it thinks they are HTML tags. I figured out the problem too, after a lot of investigating prompted by what you said. I noticed some references online to a /sbin/iscsistart file, which I didn’t have. Turns out that when you download open-iscsi from their website and then run make and make install, iscsistart is created, but not automatically copied to /sbin. So, I just installed the open-iscsi package via apt-get, and now things seem to be progressing better. Thanks so so much for your help! can you give some addvice? 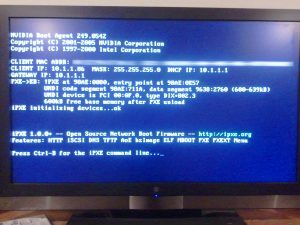 I would try booting to a live CD/USB on your client computer. Then go through the steps outlined in my second post (http://www.heath-bar.com/blog/?p=243). Are you able to connect to the disk using this method? Whether you can or not, this will help you determine if you have a problem with the way iPXE is configured, or if the problem is how the iSCSI server is configured. Do you have a firewall on the server (iSCSI target) that might be blocking access? Did you use an iSCSI password? Is your password 12 characters long? Are you able to connect without a username/password? Did you setup the correct network in /etc/iet/initiators.allow? Are you able to connect if you specify “ALL ALL” in /etc/iet/initiators.allow? Does the tftp user have access to the folder where your iSCSI disk is stored? How do you manage the situation where you have one dnsmasq instance serving multiple PCs that are doing iSCSI boots each to their own separate iSCSI target endpoint on the iSCSI target host? In other words, how would you map iSCSI targets to individual hosts who want to boot their own (separate) iSCSI endpoints? But perhaps I am missing something entirely – any ideas? Thanks. I’ll also mention that I am using Ubuntu Server 12.04, and for the most part only had to run the steps in the first guide (setting up iSCSI Targets) and last guide (setting up dnsmasq & iPXE). The intermediary steps to perform the OS install were possible from the iSCSI support already built-in to the ubuntu server CD (so I didn’t need to do apt-get install on anything, it is all supported out of the box by the Ubuntu Server CD). You can do this by booting the Ubuntu Server CD, going through the install steps like normal, until you get to the partitioning menu. Choose ‘Manual’, then you can configure an iSCSI target directly through the Ubuntu installer without having to shell out anything. Then simply reboot and do your PXE boot and you’re done. (Also if your end goal is to use Ubuntu Desktop, you can simply install the desktop packages at this point and you will have a functioning desktop just as you would had you installed ubuntu desktop to begin with).